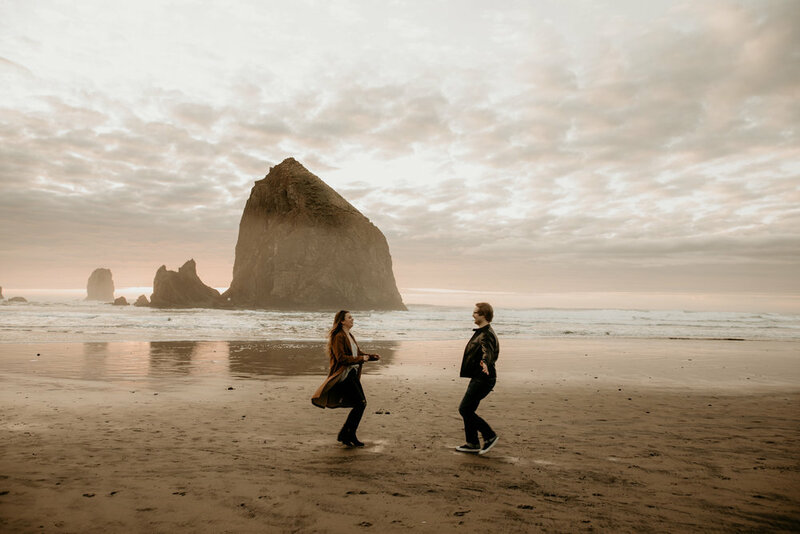 I had the best time this weekend, scampering around on Cannon Beach down in Oregon. 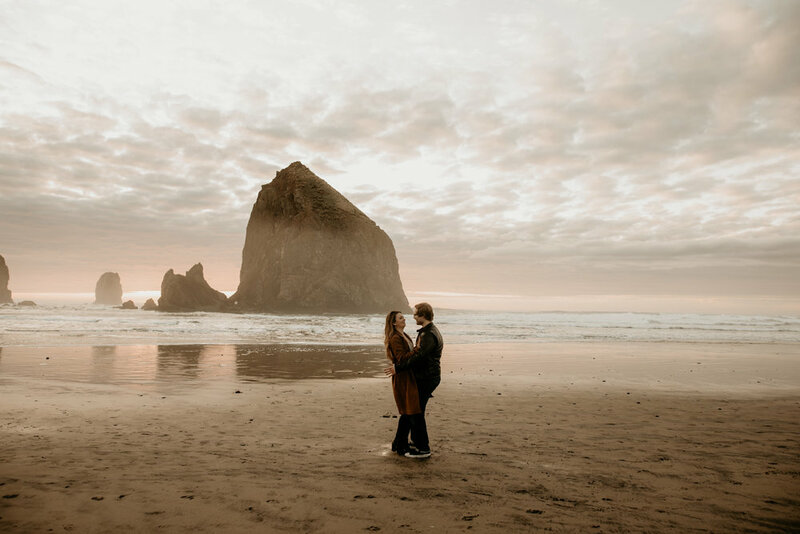 Cannon Beach is one of my favorite places in the world. I’ve been coming here since I was a kid, and exploring the Oregon coast is one of my favorite childhood memories! 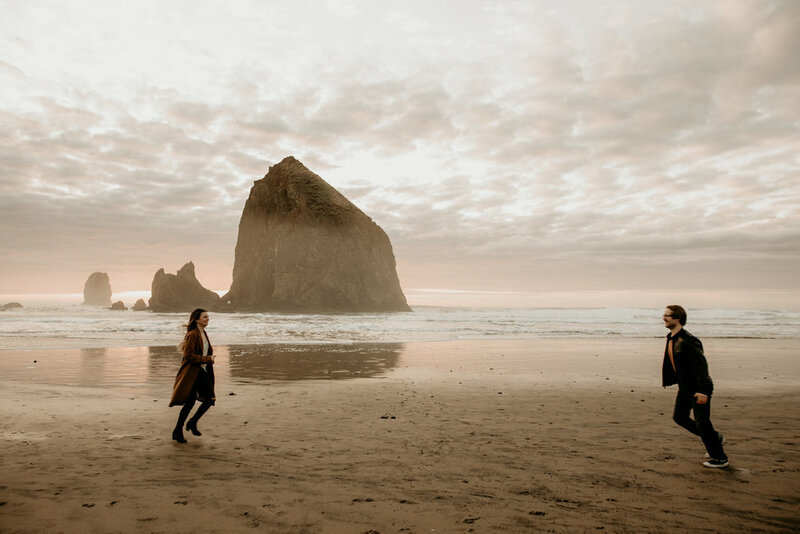 BUT I must say, even though I’ve been here so many times over the years, THIS NIGHT had the best sunset i’d ever seen at Cannon Beach in all of my life. Most of time I’ve been here, even in the summer, its cloudy and windy, and maybe even rainy. Its gorgeous, obvs, but its always a bit…wilder? Than it was this weekend. and OMG if it was like this all of the time, I would be down here every weekend! 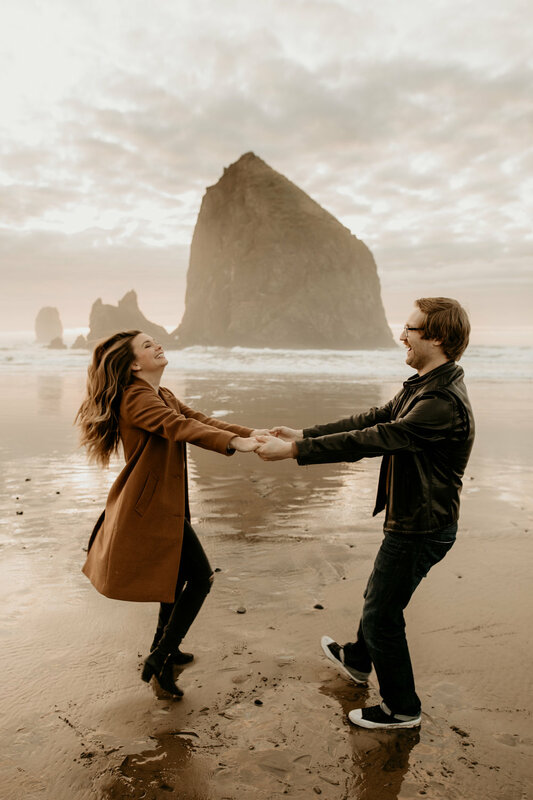 Lindsey and Brendan met in college a million years ago. Well, Lindsey met Brendan anyway. He actually got black-out drunk that night and FORGOT EVER MEETING HER! But he eventually found her twitter and followed her because they had a lot of mutual friends. 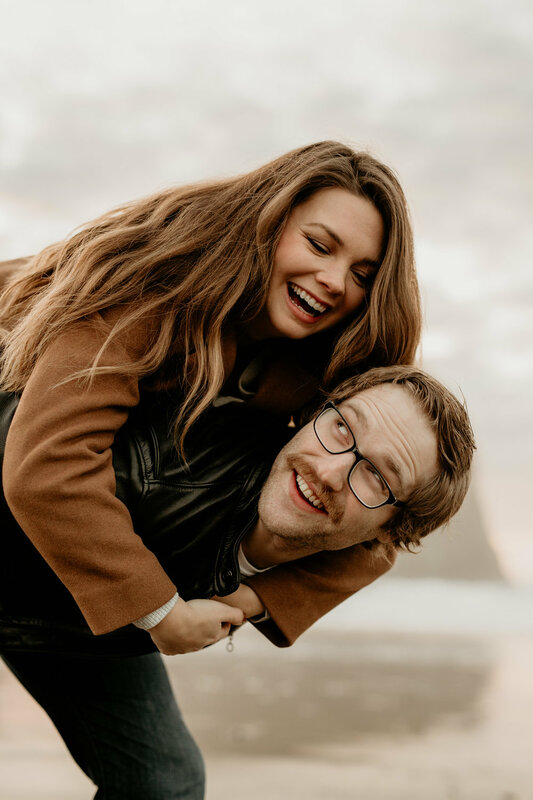 He became intrigued by her many tweets and her various opinions (“she tweets ALOT” he says) and eventually they became internet friends. Last summer, they matched on bumble. He swiped on her and she swiped back and write him “You love me!” and they started a conversation from there! 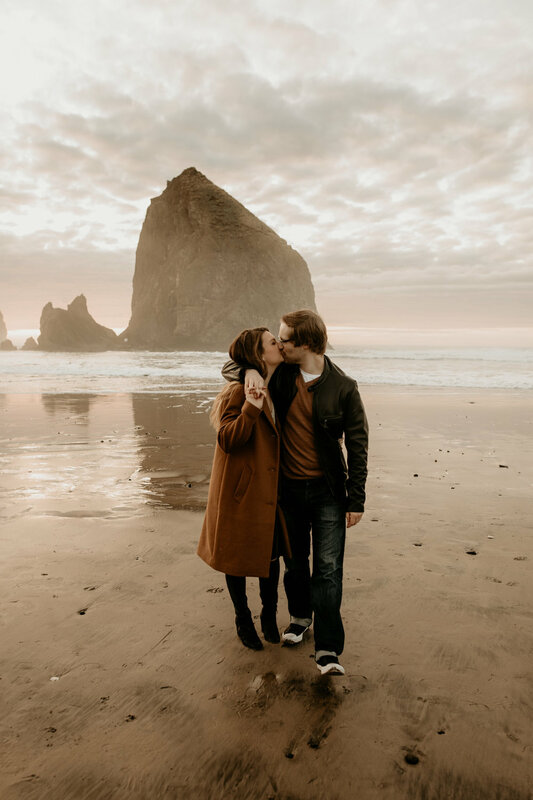 Cannon Beach is one of the most gorgeous places on the west coast with the iconic Haystack Rock that sits right smack in the middle of the beach. Its freaking gorgeous, and it has such a striking presence on the beach. The “Needles”, the smaller rocks nearby are also freaking stunning, but we didn’t feel like walking that far this night haha. Lindsey and Brendan are some of the cutest humans and they have such a special relationship. They get along like best friends, and they make each other laugh more than anyone. They both have (adorable) cats, and talk about them constantly. 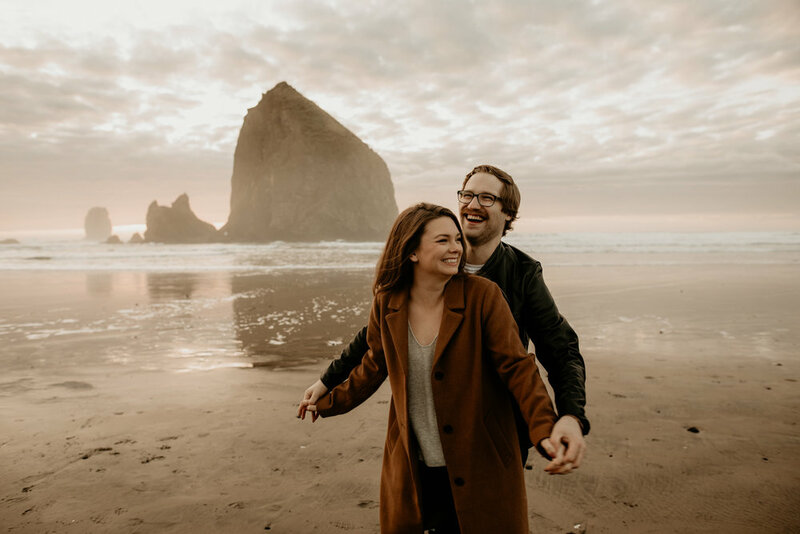 They were down in Oregon for Lindsey's birthday, and Brendan treated her to a gorgeous hotel room and a bottle of champagne. (Maybe a bad idea lol because she texted me that she had the WORST hangover the next day!) To make her feel better the next morning, Brendan shaved his usual beard into a dapper mustache: Lindsey's favorite. The mustache and the following brunch seemed to work, and she was soon raised from the dead and looked pretty alive at our session later that afternoon. It was so great getting to experience the best sunset ever with such lovely humans, and I couldn't wait to share from this session! Check out another beach session here!